And Now it’s Time to Weed! Our neighborhood snuck through this round of storms with less rain and damage than anyone we’ve talked to. Rain totals here were about 4.75 inches for the week, from late last week when the first good shower came and we shut down the irrigation system to give it a rest. We feel for the people who got 2-3 times that amount, and some ha-l to boot. We’ve been through several damaging hailstorms over the years and it’s no fun, and we’re still a little cautious about fully spelling the word. The rain that did come has been mostly moderate too — it didn’t pound until last Thursday. Up to then it had been gentle enough that it all soaked in to replenish dry subsoils, and hopefully be available to deep roots of your veggies later this summer. There were still a couple small runoff areas, but even with the pounding that rain we got, there was a small fraction of the amount of runoff and ponding that similar conditions would have created a couple years ago. The retention basin and waterways we had built last year are the main reason for that change, and hopefully there are more improvements coming in the next couple years to make this farm more resilient and able to thrive in the new extremes of weather, saving and building soil as we go. We went in to that rainy week with the fields in pretty good shape — plants in and healthy, all the necessary tractor cultivation done, and some grass and clover seeded in some new pathways. Now that it’s hopefully going to be dry enough to get in the fields it’s time to cultivate and weed the whole farm again! Every available moment for the next 2-3 weeks will be spent on tractors, holding hoes, or on our hands and knees getting all the weeds that are racing to crowd out the crops and set seeds for future trouble-making. Of course in June there are other things that pull us away from weeding, and every year while we love each job and crop, it is heart-wrenching to be pulled in other directions : the tomatoes and peas need to be tied, there are fall cabbage and broccoli plants to put in, seeds to plant for greens and lettuce, carrots and beets, and oh yeah loads of veggies to harvest and wash!…..All the while our eyes and minds wander to those weeds, just waiting for us to have a chance to get in there and do our thing. Two or three hours to weed right now is an incredibly satisfying and elusive treasure! Summer squash and zucchini will start coming in more heavily this week, after we brought in a couple handfuls late last week. The plants are still small so we picked the fruits tiny last week to keep the plants growing. From now on we should be able to pick them more regular sized, and we should have them the rest of the summer. The spinach turned yellow a week or two earlier than hoped; we asked an experienced grower friend, Linda Halley form Gardens of Eagan, and she helped us troubleshoot. We had watered it to keep it cool through some of the hotter days last month, and that may have kept it wetter than it likes to be. But it also turns out spinach needs lots more nitrogen than we have been giving it, via compost and cover crops, so from now on we’ll be feeding it like a hungry kid. It’s astounding that, looking through some charts and tables, we found that per acre spinach uses as much nitrogen as winter squash. The amount of foliage and weight of fruit in a winter squash field — with its long, pumpkin-like vines and dinner-plate-size leaves — is many, many times the amount of foliage in a spinach field, but they use the same amount of nitrogen! Now that is some food for thought. Everything else is still coming in for now. Radishes, turnips and probably kohlrabi for about 2 more weeks, plus scallions, boc choi and head lettuce 2-3 more weeks. Greens and leaf lettuce should go all summer and fall, but we might be short on good quality greens the next 1-2 weeks. (See the note in “Nuts and Bolts”). Kale we’ll have for a month or two until the bugs get it, and then it will be back in the fall. For garlic flavor, we’ll switch from the spring garlic stems to garlic scapes, the flower stalk which comes up from the center. We’ll have scapes this week and into next week, and they’ll keep up to a month in a bag in the fridge. Raw they pack a punch but cooked they are very mellow. We love to puree them raw in butter with thyme for an early garlic butter, or fry them in eggs or stir-fries. Garlic scape pesto has a vibrant green zip that is hard to beat– see the recipe below. We’ll pick some baby leeks this week or next. They are the same leeks we harvest in fall, just planted closer together and harvested much smaller. They add that same mild, rich onion flavor to quiches, soups, stocks, roasts, etc. We tried this for the first time last year and they were a hit so we planted plenty more. Beets might be sizing up as early as next week, carrots, cucumbers and broccoli after that. For all these things, the more sun the better, but temperatures over 90 can do more harm than good. They’ve certainly got plenty of rain to work with, and these temperatures are just right, so we could see lots of awesome healthy growth in the coming weeks. Always an adventure! The Strawberries look very good. Overall it looks to be a good harvest this year–plenty of berries, super-tasting, and this dry weather is right on time, since more wet cloudy days would rot many berries as they ripened. (Hopefully the weather stays dry, despite that small chances of rain all week). Last week’s rain, while it made some get soft and rotten, will hopefully help the later berries size up. A couple notes to keep in mind when picking strawberries this year: wave your arms and fish through the plants with your hands, they’re in there! We have more dirty berries than usual–there’s less straw out there than usual and we don’t know where it all went, maybe blown by the wind, or we just put on too light, not sure. Sitting on the dirt has added to the soft rotting for some of the low-hanging fruit. The later berries, later this week and next, will be smaller than this first flush, but hopefully we can all find the patience to pick them! The email this weekend helped get the berries picked that otherwise would have gone by over the weekend. 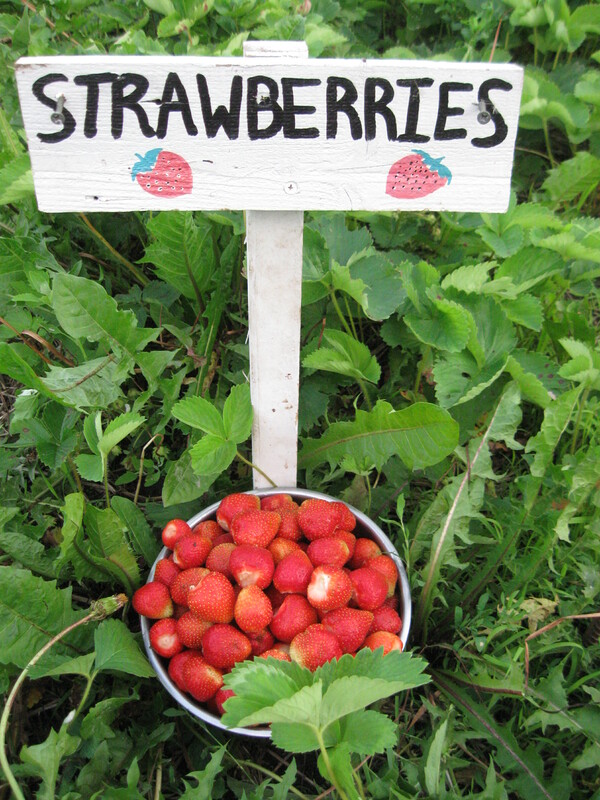 Whether or not you picked this weekend we hope to have plenty more berries for you to pick this week. Strawberries are closed for picking when the leaves are wet. This is the best prevention to avoid spreading the fungal spores that cause the rotting. Please wash U-pick containers after each use -you can wash at home or here in the handwashing station. If you have any yogurt containers bring ’em on in, we’ll take them in the barn. Pea tendrils, or pea shoots, will be ready soon. These are peas bred for their tendrils, or tips — the curly thread they climb with, and the tender stem with the top 2-3 leaves. They are light and full of pea flavor, great added into a salad or stir-fry. A taste of what’s to come! The tendrils will have a sign on the row, they are short plants right next to the driveway. They will make a snow pea later on if conditions are right. The snap and shelling peas, taller and strung up to fence posts on the far side of the strawberries, are flowering now and should be ready in 2-3 weeks. Please don’t pick their tendrils , they need them! They’re running a lil late with the cool wet start so hopefully there’s not a heat wave when they’re ripening. Cilantro is ready, and now weeded! There is some thistle at the end of the row, beware with bare feet and flip-flops. Though it’s tempting, please do not pick the basil yet, we’d like to let the plants get bigger before everyone starts pinching tops. On that note, a reminder: U-pick crops are open for picking when they are listed on the U-Pick board and have a white sign at the end of the row. You might know that while most of the produce we grow goes to you, about one-third of what we grow is sold to wholesale accounts. We deliver 2-3 times a week to Just Food Co-op, St. Olaf College, Carleton College, and occasionally to local restaurants. Again this year we’ll be selling to The Emergency Foodshelf Network in New Hope, MN — a warehouse serving food shelves around the state, and using donations to purchase fresh produce from local organic farmers to distribute to people in need. As an added benefit to your share, we like to offer extra produce for sale at or near our wholesale prices. This is great if you’re feeding a crowd, want to give a gift to a friend, freeze, dry or can for the winter, or if you simply want to eat more of some of your favorite veggies. This week’s selection is : Lettuce Mix for $5 / lb, Boc Choi for 1.50 each, , Garlic Scapes for $3 /lb, Salad Turnips and Radishes (no tops unless you ask for them) for $1/lb. Lots more crops available as we go through the season. Save the date! Saturday, July 12th — 5:00 Farm Tour, 5:45 Gather and Eat. Everyone is welcome! Kids, friends, nice aliens and monsters too! We hope you can come share a meal with us and each other. The flea beetle is a tiny, shiny black beetle (not a flea) that devours plants in the brassica family: which includes broccoli, cabbage and kale, and many of the greens we grow for salad: totsoi, komatsuna, and mizuna especially. The big white blankets are called row cover, and are used to keep flea beetles off of those crops. Row cover is a very useful tool for organic veggie growers for several insects, and for keeping heat-loving crops warm in cold times. We use it for a few weeks in the spring on many crops, but all summer on those greens. Since we’re planting fresh every week, there are always tender young seedlings for the beetles to gnaw on! Usually the row cover works, at least well enough. Sometimes you’ll see a few pin holes in the leaves. But this week’s planting, and maybe another, has been almost decimated by a beetle feeding frenzy underneath the row cover. Somehow they snuck in and went to town. We choose to not spray insecticides on the farm, for your health, our health, and the health of the beneficial insects and the rest of the farm and world ecosystem, so here we are. Having been outmaneuvered by the flea beetle, we will be a little short on greens this week, and maybe next. We have oodles of lettuce, since flea beetles don’t eat it and it has no constant insect or disease pests, and good amounts of arugula too. So you’ll get the same volume of salad stuffs, but less variety. If we do pick some totsoi or komatsuna, it will probably be tougher and stronger-flavored than usual, and not up to our usual visual standards either. We know some of you won’t mind those things so we might put some out with a warning sign, if you still want it you can help yourself. When we move to the next piece of row cover in a week or two, we should be able to pick some “un-holey” leaves. We forgot to give these to some of you new this year, if you didn’t get one please ask for yours! Combine the scapes, pine nuts, lemon juice and zest, salt, and pepper in the bowl of a food processor fitted with the blade attachment. Pulse about 20 times, until fairly well combined. Pour in the olive oil slowly through the feed tube while the motor is running. When the oil is incorporated, transfer the pesto to a bowl and stir in the grated cheese. If you plan to freeze the pesto, wait to add the cheese until after you’ve defrosted it. Whisk together all the dressing ingredients in a small bowl until combined. Let stand to meld the flavors, whisking occasionally to keep it from separating. The dressing can be made ahead of time and refrigerated; bring it to room temperature before assembling the salad. Drizzle the chicken with soy sauce and sprinkle with salt, pepper, garlic powder, and ginger. Broil it for 10-15 minutes, or until cooked through, then let cool and slice into thin strips. Combine the bok choy, green onions, and almonds in a salad bowl. Add the dressing and toss to combine. Serve immediately topped with chicken slices and chow mein noodles. Serves 4.